Week 4 marks Minnesota’s first divisional game of the season as they host the Detroit Lions. Detroit swept the Vikings last season with an overtime thriller in Minnesota (22-16) and a 16-13 win on Thanksgiving Day in Detroit. Sunday also marks former Lions LT Riley Reiff’s first game against his former team. The Lions lost Reiff and RG Larry Warford to free agency this offseason but had no issue replacing them quickly with Pro Bowl linemen TJ Lang (Packers) and Ricky Wagner (Ravens). On the opposite side of the offensive line, the Lions’ production hasn’t been as fortunate. LT Taylor Decker went down in the offseason with a shoulder injury and was placed on the PUP list to begin the season. The Lions traded for former 1st round pick Greg Robinson (Rams) back in August to replace Decker until he is healthy enough to return. Detroit’s offensive line has done a fair job of keeping Matthew Stafford clean through the first three weeks of the season. Greg Robinson will have his game tested on Sunday as he faces Everson Griffen who has 4 sacks this season through 3 games. RT Ricky Wagner will also have his hands full on the other side of the offensive line as he lines up against Danielle Hunter who is looking for his first sack of the season in week 4, after coming off a 2016 season where he finished 4th in the NFL in sacks (12.5). Matthew Stafford’s career stats against the Vikings: 21 touchdowns, 6 interceptions, 230 YPG, 91.1 QB Rating. Record: 7-7. Matthew Stafford just recently became the highest paid player in NFL history. Is he worth that? Probably not. But to the Detroit Lions, he is. Stafford is off to a strong MVP candidate start this season with 7 touchdown passes and just 1 interception. Since coming into the league there isn’t a QB who has more 4th quarter comebacks than Matthew Stafford and he was close to adding another check to his resume’ last Sunday against the Falcons. The Vikings have had success slowing down Stafford in the past when they pressure him and force him to make bad decisions. With Taylor Decker still sidelined and a pressure-heavy defense in Minnesota, it will be interesting to see how Stafford and Lions respond in this divisional matchup, after having their hearts broken in week 3. What do the Vikings need to do to ensure that they go 1-0 in the division on Sunday? Pressure Stafford: As I’ve already stated, the Vikings need to pressure Matthew Stafford and force him to make quick decisions. It doesn’t matter who the QB is, if you hit him enough he will eventually make a bad decision, or it will flaw his accuracy. Stafford’s ability to extend plays outside the pocket also poses a grave threat to a defense. Griffen, Hunter, and Robison will have to set the edge and do their best to contain him in the pocket. They can’t allow him to keep plays alive with his legs. The Vikings defense had a hard time staying off the field against the Lions last season due to an unproductive offense. Minnesota is going into this game relatively healthy on the offensive side of the ball, which should help the defense out in the long run. Score Touchdowns: Yes, score touchdowns. The key to winning any football game is to score touchdowns, right? The Vikings are 22-3 under head coach Mike Zimmer when they score AT LEAST 21 points in a game. 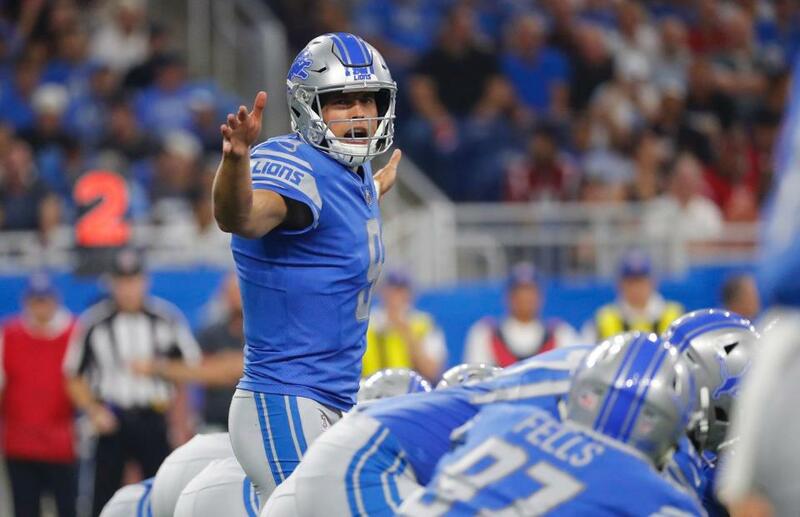 The Lions are coming off of a heartbreaking loss against the Falcons and you can bet the farm they’ll be out for blood and hungry for another win. The key to success in this game for the Vikings is to set the tempo early up front and establish Dalvin Cook early in the run game to open up passing lanes. Offensive Coordinator Pat Shurmur called a great game against Tampa Bay last weekend. It will be interesting to see if he can put together two games in a row. Take Golden Tate out of the game: Vikings Head Coach Mike Zimmer will undoubtedly have a game plan in place to ensure Golden Tate doesn’t do what he did to the Vikings last season in Minnesota. Lions WR Golden Tate is a great option for Stafford on screens and underneath crossing routes. If the Vikings can find a way to take him out of the game it limits Detroit’s ability to move the ball productively with added pressure. Golden Tate had 11 catches for 79 yards, and the game-winning touchdown in overtime last season in Minnesota. Mike Zimmer and his top cornerback Xavier Rhodes will do everything in their power to take Golden Tate out of Detroit’s game plan. Dave Birkett of the Detroit Free Press was kind enough to answer some questions I had for him regarding the game on Sunday. You can give Dave a follow on Twitter at @DaveBirkett. 1. What’s the key matchup in this game that no one will talk about leading up to Sunday? Everybody’s talking about Everson Griffen vs. Greg Robinson after Griffen’s comments earlier this week, so I can’t pick that. But I do think there’s an interesting battle brewing between a couple of rookies, the Lions’ Jarrad Davis and the Vikings’ Dalvin Cook. The Lions missed Davis dearly when he was out last week with a concussion. He’s a good tackler, a capable pass defender and he brings an attitude to the Lions’ defense. 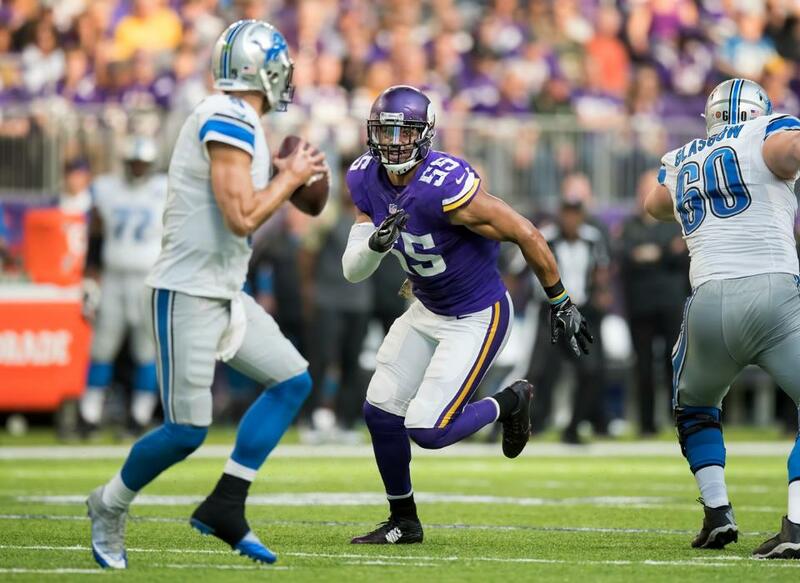 Cook has come up big in both Vikings victories, and the Lions – and Davis – need to limit his yardage both on the ground and through the air if they’re going to win. 2. What do you expect from Riley Reiff as he faces his former teammate Ziggy Ansah this weekend for the first time? I give Ansah the edge in this matchup, though he’s still not 100% recovered from the knee injury that kept him out the entire preseason. Ansah had three sacks against the Giants and a quiet week last week against the Falcons (no tackles), so there’s no telling which player shows up Sunday. These two know each other well, and I’ve seen enough of them in one-on-ones over the years to know that Ansah is the better player. 3. Stefon Diggs and Adam Thielen have taken the 2017 season by the horns thus far. What do the Lions need to do, to slow the Vikings WRs down? The Lions have a much improved secondary this year, with seven interceptions through three games. Darius Slay will cover Diggs much of the day (though the Lions don’t usually travel Slay), while Quandre Diggs will handle slot duties vs. Thielen. Fortunately for the Lions, those are their two best cornerbacks, and Slay is playing a Pro Bowl level so far. Stefon Diggs will get his share of catches, he’s that good a player. The Lions just have to make sure he doesn’t kill them deep. 4. The Vikings defense has only allowed 182 rushing yards through 3 games thus far. Is it a fair assessment to say the Lions have to run the ball well on offense to secure a win in this game? Running the football always helps, and if the Lions somehow can manage that feat against a good Vikings defense, it should help their chances. But I don’t think they need a great game rushing the football to win, necessarily. Ameer Abdullah will get 15 touches. The Lions aren’t ones to abandon the run. But they’ve had limited success rushing the football early in games so far and I don’t see that changing much Sunday. 5. Give me one prediction for each team in this game and a final score. Golden Tate caught 16 passes in two games against the Vikings last year, and he should be in for another busy day Sunday. I can’t imagine the Lions want Matthew Stafford to hold the ball for too long against that Vikings defense, so put Tate down for 8 to 10 catches. On the flip side, I see Dalvin Cook having a nice day for the Vikings. Devonta Freeman ran 106 yards against the Lions last week. I don’t see Cook getting quite that much, but 90 yards on the ground and another 50 through the air seems doable. With Cook having a nice day, I think the Vikings pull out a squeaker, 20-16. My Vikings prediction: Kai Forbath game-winning FG.